Genuine green advertising is not commercials promoting eco-friendly goods—to have a legitimate right to be called ‘green,’ the message should be placed in the medium made of natural elements, literally. This notion underlies Coca-Cola’s idea to construct a plant billboard in Philippines—the project was developed in collaboration with WWF, which have partnered with the soft drink giant on climate protection and water conservation in the country. Earlier this year, Coca-Cola unveiled an orange-powered Energie Naturelle advertising stand for its Tropicana brand in France, and now it has created a billboard using CO2 absorbing plants. “We are proud that we have brought to life the first plant billboard in the country. It is an embodiment of our company’s Live Positively commitment to making a positive difference in the world by incorporating sustainability into everything that we do. With this, we hope to inspire Filipinos to join us in our journey, because we know that together, we can make a positive impact,” stated Guillermo Aponte, president of Coca-Cola Philippines. 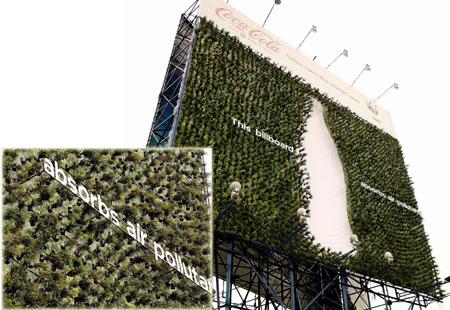 Each of the 3,600 trees on the billboard can absorb up to 13 pounds of CO2 a year, commented botanist Anthony Gao. “This billboard helps alleviate air pollution within its proximate areas as it can absorb a total of 46,800 pounds of carbon dioxide from the atmosphere, on estimate,” he added. The light-weight potting mixture includes organic fertilizers and industrial by-products, the stable pots for the trees are made of recycled bottles of Coca-Cola’s drinks. Now the plants are small, but since they are placed not very close to each other, the can grow sideways and make the billboard greener and yet more powerful in terms of air cleaning. Hopefully, the plants will live the long life on the billboard thanks to the clever and well thought out eco-friendly mechanism, which provides proper water treatment. “A drip irrigation system, also known as trickle irrigation or micro-irrigation, was especially installed for efficient water distribution. This irrigation method saves water and fertilizer by allowing water to drip slowly to the roots of plants, through a network of valves, pipes, tubing and emitters. The system is operated on a schedule to distribute water with nutrients to the plants,” states the press release. Is it a new trend? Will natural billboards replace plastic stands? With Coca-Cola’s dedication to sustainable life-style it really can happen (at least for the company’s drinks).